Memorial Day just passed, and as usually it was a beautiful weekend full of fun, relaxation, and of course remembrance for our fallen family members. Our celebration had many of the traditional favs. Grilled meats, potato and pasta salads of various variety, dips, etc. Of course, it also included family & friends. What it didn’t have, was specifically themed Patriotic dishes. At first, I didn’t think anything of that. No big deal, it’s not necessarily essential, right? 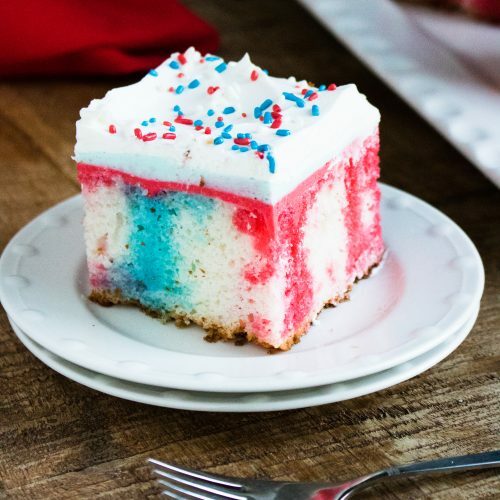 Then I made the classic mistake of getting on social media, where I was immediately hit with the full force of everyone else’s edible Patriotism, especially in the dessert department. That got me thinking, the 4th of July/Independence Day is right around the corner. What patriotic thing am I gonna be making for my dessert table? I’ve done it before, and I really like the idea- and want to do it again this year. Poke Cakes have made a huge come back in the past couple years in the dessert world, so naturally I decided to go with one. 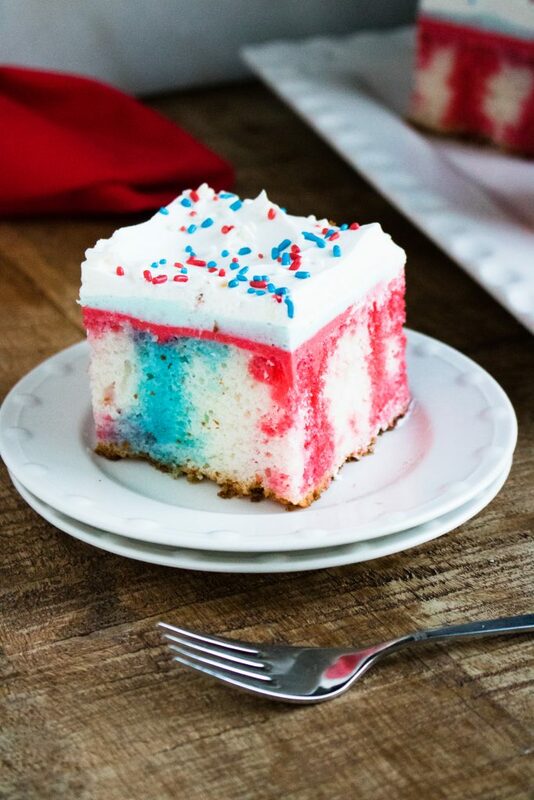 Specifically, a Red White & Blue Poke Cake. Poke Cakes became wildly popular in the 70’s. They were a fun way to add a ‘pop’ or color to an other wise delicious, but plain dessert sheet cake. Basically you bake a normal 9×13 box mix cake, and let it cool. When cooled, use the end of a wooden spoon and poke holes evenly out into the entire surface. You then fill those holes with anything from brightly colored jello mix, sweetened condensed milk, caramel, or even pudding. Smooth it over so the filling evenly creeps into and fills each and every hole, and chill until it’s solidified. Topped with cool whip or another whipped topping, it’s an easy dessert to make and simple to customize for any occasion or holiday! 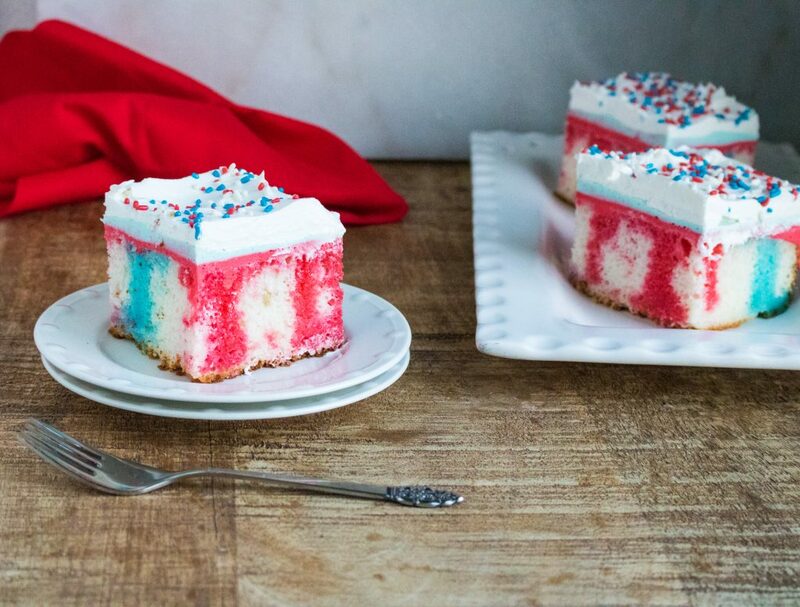 This Red White & Blue Poke Cake is just as quick and easy, but makes a splash with its stunning presentation. 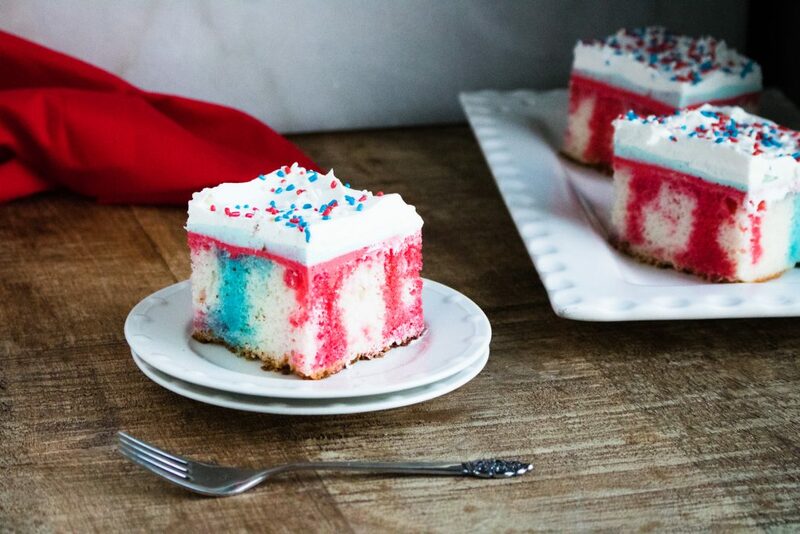 A fluffy white cake base is studded with bright pops of red and blue sugared cream cheese pudding veins. Topped with a thick layer of whipped topping and a sprinkle of holiday-themed, well, sprinkles each slice looks like a little fire cracker. 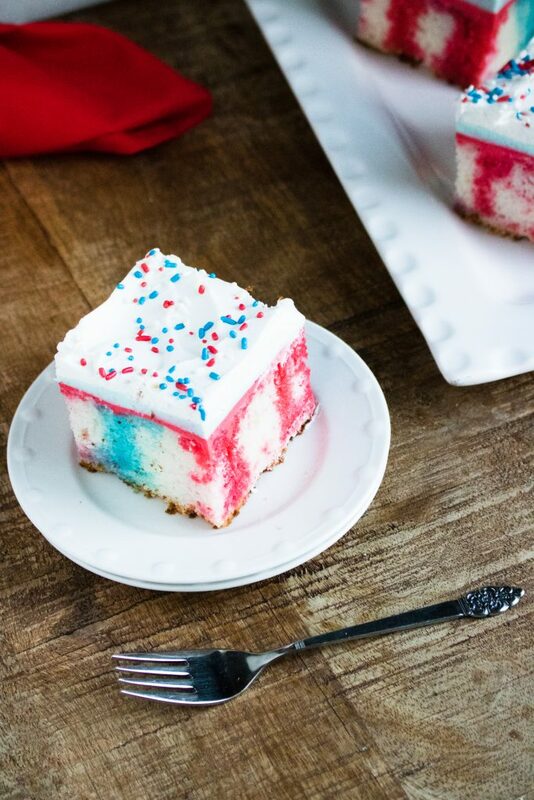 Your Independence Day celebration will be perfect when topped off with a thick slice of this fire cracker Red White & Blue Poke Cake. Other easy cake recipes you might enjoy: Glazed Strawberry Lemon Yogurt Cake, Chocolate Malted Milkshake Cake, and Bananas Foster Upside Down Sheet Cake. 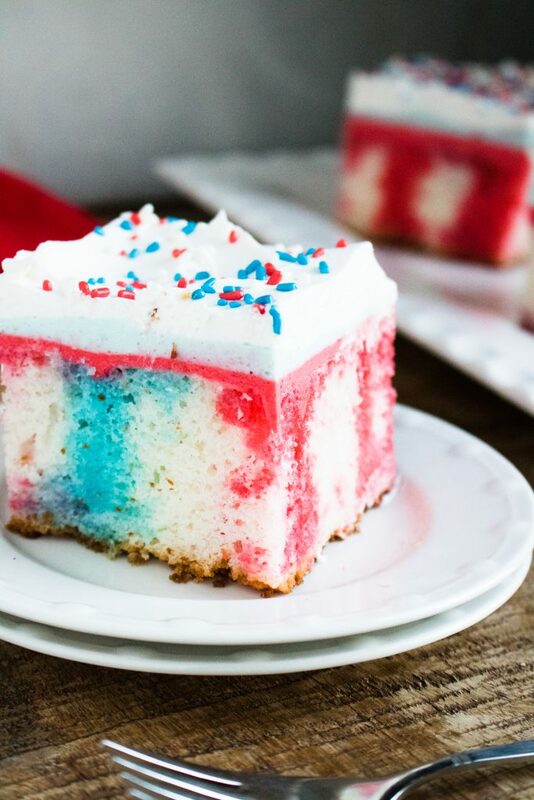 An easy patriotic dessert with vibrant strokes of red, white, & blue- this poke cake is perfect for celebrating the Summer holidays. Liberally spray a 9x13" baking dish with non-stick cooking spray. Mix up and bake the white cake in the dish, according to the package instructions for it. Remove the cooked cake, and let completely cool. Use the end of a wooden spoon to poke evenly out over the cake. In separate bowls, mix together the red and blue jello, each with one cup of boiling water. Spoon half (reserving the other half) of the jello mixture evenly out over the cake, making sure to pour and spread over the holes. For best presentation results, do a row of blue, then red, and repeat. Next, in two separate bowls, add 8 oz of cream cheese, 1/4 cup of the sugar, and the remainder of the red to one bowl, and the blue to the other. Stir to completely combine. When smooth, add food coloring- as needed- to make the mixture more vibrant. Spread the red cream cheese mixture out evenly over the cake, then the blue. Chill for an hour. Spread the whipped topping evenly out over the top of the cake. Chill for 4 hours. Sprinkle with the festive sprinkles right before serving. Slice and enjoy! Love the colors! I’m with you. I decided I’m not making anything for a holiday then go to IG and see all the other amazing recipes people are making and then I end up making something too 😌 Thanks for sharing at FF! don’t forget to link back to Fiesta Friday.